Made by Zanotta SpA in Italy, Europe, 1986. 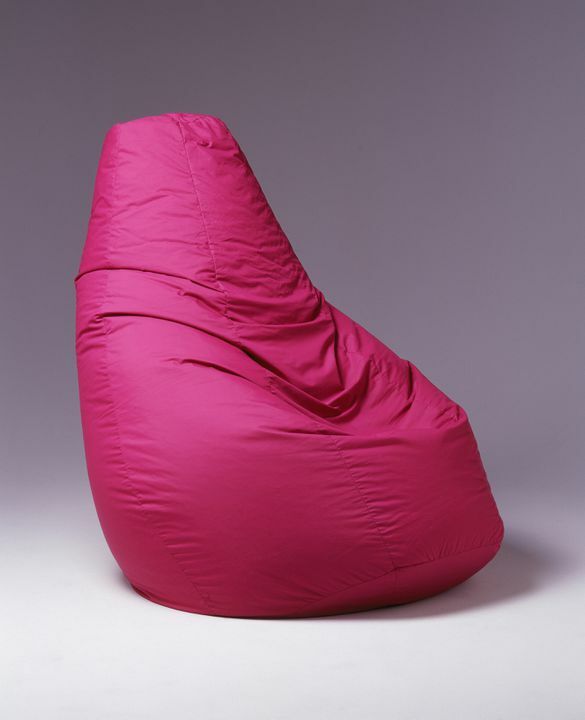 Of all the novel chairs designed in the 1960s, the beanbag was the most popular and certainly the most copied. It also best symbolises the daring showing by designers seeking inventive solutions to the needs of a rapidly changing world. This beanbag chair, the ‘Sacco’, is made of ‘Telafitta’ (cotton/nylon) with polystyrene beads inside. It was designed in Italy in 1968 by Piero Gatti, Cesare Paolini and Franco Teodoro and manufactured by Zanotta since 1968. This example dates from 1986. A large pear-shaped bean bag chair filled with polystyrene balls. Covered in purple 'telafitta' fabric (50% cotton, 50% nylon) with a metal zip fastener on the base. All seams are machine stitched. Manufacturer's tag attached to base. Inscription on manufacturer's tag attached to base, "A NORMA DELLE LEGGE 883 DEL 26.11.73 / 50% COTONE 50% NAILON / CONTROLLO N / QUESTA ETICHETTA NON PUO / ESSERE RIMOSSA SE NON / DAL CONSUMATORE FINALE / THIS TAG NOT TO BE / REMOVED EXCEPT BY / THE END CUSTOMER / CETTE ETIQUETTE NE PEUT / ETRE ENLEVEE QUE PAR / LE CONSOMMATEUR FINAL / DISE ETIKETTE DARF / NUR VOM ENDVERBRAUCHER / ENTFERNT WERDEN / Zanotta s.p.a / MADE IN ITALY". Designed by Piero Gatti, Cesare Paolini and Franco Teodoro, Italy, 1968 and made by Zanotta Spa, Italy, 1986. Architects Piero Gatti [b 1940], Cesare Paolini [1937-1983] and Franco Teodoro [1939-2005] established a studio in Turin, Italy in 1965, collaborating on architectural, graphic and industrial design products. Their most significant and enduring design was without doubt the 'Sacco' chair produced by Zanotta. A shaped leather or fabric bag, three quarters filled with thousands of polystyrene 'beans', the 'Sacco' was relatively cheap, easily portable and, in the spirit of the 1960s, eminently suitable for being 'laid back' on. So successful was the design that a multitude of versions covered in fabric or vinyl - the familiar beanbag - have been in production ever since. In an interview in 1988 Piero Gatti stated 'many of us were interested in designing objects which were as flexible as possible which could adapt to different situations ...different physical structures. So we said think of a chair that will allow for these functions. We began to think about a material that would allow for this adaptability, both for the body and its positions: like snow, you throw yourself into it and make an imprint in the fresh snow, or a fluid like water'. While considering comfort and practicality, the designers of the Sacco were also motivated to produce a piece of radical 'anti-design' that suited the era's politics and flew in the face of the 1920s modernist classics by architects such as Le Corbusier and Mies van de Rohe that were being reintroduced at the time. However, surprisingly commercial success was only around the corner. In 2008 for the 40th anniversary of the 'Sacco' Piero Gatti recalled in an interview for 'Zanotta Happenings', 'First we had a contact in the U.S. following a publication in an American magazine (Long Furniture Daily), we also went to 3M and then department store Macy's saw the magazine (the name of our prototype was 'Moll you are', that is 'shaped by yourself' ) and their proposal took us by complete surprise. They wanted to know if we could produce 10,000 pieces right away! This is when we met with Zanotta. He understood the force behind 'Sacco' and was able to immediately start working on the first functional prototypes. The rest is history!